Modern fathers don’t realize that they play an incredibly big role in the process of their kids’ upbringing. Sure, reliable financial provision and security are crucially important, but not the main functions of a good father. Good father shouldn’t be only a breadwinner, but a positive role model and a source of emotional security for their kids. Beneficial male influence helps boys gradually turn into strong manly men. Girls reach puberty later than other girls and become confident and independent women. Unfortunately, many fathers who face total misunderstanding in the relationships with their kids, often shift the blame to the children’s fragile shoulders. They say that children’s misbehavior, moods and insecurities are to blame. In my opinion, parents, especially fathers, should once and for all understand that their children are the reflection of themselves and the outcome of their parenting styles. Every father should know that his insecurities, stereotypes and models of parenting can have a detrimental effect on the child’s development. Fathers should read this article to find out whether they belong to a certain type of dads and take immediate actions to save the situation. Remember that your decision to change your parental style can significantly improve the quality of your child’s life and help them overcome various insecurities. There’s a type of fathers who’re always busy, as if they’re Secret Service agents who’ve to complete numerous missions, save the world and do everything except taking active participation in the process of their kids’ upbringing. But it doesn’t mean that such fathers are totally indifferent to their children. From time to time, they try to devote time and attention to their kids, but these acts of good will and kindness aren’t enough. As a result, the kids of emotionally distant fathers usually feel lonely, unnecessary and unhappy. When nothing changes for the better, these obsessive feelings and thoughts gradually transform into deep-seated fears, insecurities and diffidence. If you’re a busy bee dad and don’t want your kids to become the victims of fears or have a lot of hang-ups, you should sometimes sacrifice your career, hobbies and other priorities for the sake of your child. Unlike a busy bee dad, an invisible one is a type of father who plays no role in his children’s lives, because family life and upbringing of children aren’t his priorities. Conceiving a baby is an extremely pleasant process, but both parents should understand that this decision requires an incredibly big responsibility. Biological dads who’ve once cut their children out of their lives aren’t fathers anymore, because a real father is the one who’s sacrificed and dedicated his life to the development and prosperity of the kid. Children who grow up without a father often can’t find their place under the sun, because their hearts are overwhelmed with a feeling of resentment. But what’s the origin of this dreadful resentment? The absence of father’s care is the thing that can trigger various psychological problems, plunge the child into a long-term depression and spoil the best most productive years of their life. Even though men don’t have PMS, sometimes it seems that it’s not true, because modern world is full of chronically dissatisfied men who grumble and complain about something almost all the time. Many of these pessimistic and grim-faced men are fathers who bring up kids and play an important role in their development. Unfortunately, these kids get no emotional support, because they find it difficult to come to an understanding with their fathers, please them and get their approval. As a result, the father’s chronic cycle of dissatisfaction gradually poisons the relationships with children. It often makes children suffer from a kind of emotional abandonment. Emotionally rejected kids often face an inner conflict and can’t understand whether their dissatisfied fathers love and believe in them or not. If you’re a chronically unhappy father, you should take the matter into your own hands and make the first step towards reconciliation and mutual understanding. If you don’t have even the remotest idea how to move the situation off dead center, you should seek professional psychological help. In most cases, fathers are unhappy because they were emotionally abandoned by their parents. Now it’s the high time to put a stopper on this family curse and wave goodbye to a cycle of total misunderstanding. Modern parents have finally realized that children’s psychological well-being is the pledge of their future success, good health and prosperity. Both mothers and dads read a lot of books, articles and attend developmental seminars to expand their knowledge of psychology and bring up psychologically healthy kids. While it’s a wonderful tendency, parents should be careful with psychological experiments and techniques, because wrong methods can only worsen the situation and lead to irreversible side effects. There’s a type of fathers who don’t punish or reprehend their kids. They are simply afraid to hurt their feelings. They wholeheartedly believe that their remarks, punishments and educational measures can have a negative impact on the child’s self-esteem and cause a psychological trauma. This psycho-pedagogical approach is a big mistake. Children without healthy limits and moral boundaries usually find the world a difficult place to live in. They have no sense of responsibility and discipline, because their permissive fathers didn’t accustom them to the rules, schedules and moral values. Such fathers should accept this mistake and teach their kids to behave properly, act honestly and respond adequately to criticism. Children should develop a clear understanding of what’s good and what’s bad. Then they’ll be finally able to live in harmony with others. Some fathers behave like caring mothers or even nannies. They cherish their children like the apple of an eye and cater to their every whim. They think their kids are small and helpless creatures even when they turn into teens. These fathers can’t understand that their platonic love and excessive care don’t give the child an opportunity to do something independently. The statistics prove that the kids brought up by extremely caring parents usually lack motivation to struggle for their success, existence and prosperity, because their problems are usually solved by a nurse dad who’s always ready to give a helping hand. It’s okay to support children, but don’t cross the line. Your frank desire to help will play a low-down trick with you and turn you into a nanny in the twinkling of the eye. You see that both too much care and its total absence have an extremely detrimental effect on children. It means fathers who stick to the happy medium bring up happy, successful, and confident kids. Bodyguard fathers are the ones who build symbiotic relationships with their wives and children. Unfortunately, this type of a father-child relationship is also very dangerous due to a reciprocal emotional bond. If the father feels blue, then the same trouble happens to his child. 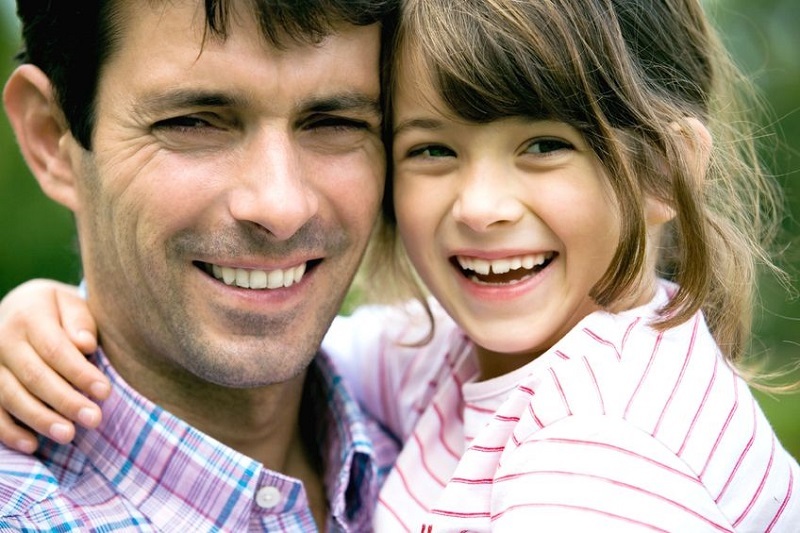 At the same time, bodyguard dads are very sensitive to their kids’ troubles and misfortunes. Consequently, both kids and their fathers become emotionally codependent and unable to enjoy the beauty of an independent life. These children will always try to build strong emotional contact with other people. Bodyguard dads should do something until it’s too late. But what can be done to resolve this challenging dilemma? It’s necessary to find new hobbies and focus on your own life as well. Try to understand that symbiotic relationship won’t let your child become a happy and independent person in future. Authoritarian father is a parent whose priority is to bring up well-mannered, intelligent and disciplined children regardless of everything. Fathers usually choose authoritarian parenting style, because they were raised by authoritarian parents as well. This parenting style kills children’s self-esteem and makes them obedient. Kids suppress their feelings and emotions, and lack courage and authority to contradict their severe fathers. Psychologists recommend authoritarian fathers to relax the grip and give their kids a chance to take a gulp of fresh air. Otherwise, suppressed and deep-seated emotions will cause serious disorders and turn their children’s life into hell. Being a good parent isn’t easy. Sometimes even good intentions can lead to a problem. These problems will fade away as soon as you realize that there are no perfect fathers in this world. The main thing is to curb your ego and be ready to reinvent yourself for the sake of your child’s success and well-being. What other types of fathers do you know?